When it comes to pool aprons there are a lot of options, and the sky is the limit. Concrete and pavers are the two primary materials and both offer many color choices, textures, and options in terms of patterns and designs. Decorative colored concrete is the most popular around pools due to its versatility and cost, and represents the best value in pool decking. The main benefit to concrete is that it is cheaper to install compared to pavers or natural stone. It is also much quicker to install. In most cases it can be completed within four days of work. Those four days may become twice as many days on the calendar due to weather and building inspections, but again much more attractive than the weeks that pavers can take. Concrete also doesn’t need resanded like pavers, doesn’t settle and fall out of pattern like pavers, and doesn’t have the weed and moss growth that can occur with pavers. Though concrete is the most popular that doesn’t make it the perfect. There are distinct cons to both decorative concrete and regular broom finish concrete. First and foremost the main con to ANY concrete is that it WILL CRACK. All concrete cracks. It is caused by the concrete shrinking during the curing process as well as being put under stress over time and settling. If anyone says their concrete doesn’t crack they are lying to you. Period. To overcome this shortcoming concrete is installed with either tooled joints (most sidewalks have them every four feet or so) during the finishing process or by saw cutting joints (Home Depots floor is saw cut) into the slab in strategic places where stress cracks are anticipated. These relief cuts and joints give the concrete a place to crack where we decide (and hope) rather than randomly and are planned out based on aesthetics and function. The question that we ask ourselves as we layout the joint plan is ‘where is the stress going to occur and where is this concrete most likely to crack?’ Once we answer this we compare it to what will look nice and that becomes the layout. MOST of the time we are right. Sometimes we are not and a crack may occur outside of the joint. This is simply the nature of concrete. Beyond the inevitable crack in concrete the other down fall is that it has blemishes and inconsistencies. As hard as we try there are always going to be color as well as texture variations in a given concrete slab, particularly when it comes to decorative concrete. 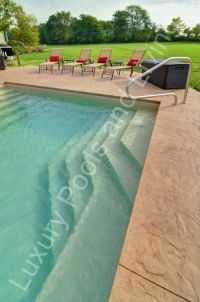 The coping around the pool can also be rough and contain minor imperfections. These imperfections and variations can typically be masked and blended away into a slab that has the ‘natural stone’ look. Due to this repair-ability and camouflaging the stone texture has become our most popular concrete decking because stone by nature is not perfect. Ironically the imperfections typically make the stone appearance more believable. This masking can also be a huge benefit when it comes to repairing a crack should one show up outside of the control joints.